240 pages | 4 B/W Illus. While many police officers undertake their work conforming to the highest ethical standards, the fact remains that unethical police conduct continues to be a recurring problem around the world. 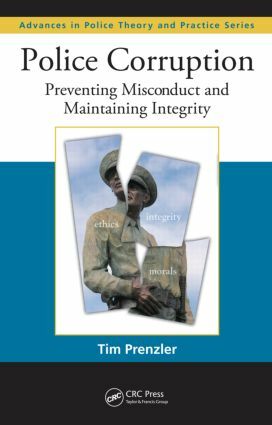 With examples from a range of jurisdictions, Police Corruption: Preventing Misconduct and Maintaining Integrity examines the causes of police misconduct and explores applied strategies designed to maximize ethical conduct and identify and prevent corruption. Introducing the phenomenon of police officer misconduct, the book provides an analysis of unethical behavior, its effects, and different causal factors. The author examines the impact on the community and the police themselves, the dilemma of establishing universal ethical principles, and ways of identifying and measuring misconduct problems. The remainder of the text examines applied strategies designed to maximize ethical conduct and prevent corruption. Exploring a wide range of approaches, the book discusses best practices in the recruitment of ethical applicants, strategies for dealing with misconduct, risk reduction strategies and early warning and intervention systems, along with advanced strategies such as drug and alcohol testing, integrity tests, and the use of covert surveillance. The text also explores the role of independent external oversight bodies that audit police strategies and conduct their own investigation. The final chapter on ethical leadership emphasizes the need to go beyond a checklist of rules with leadership that values, requires, and models integrity in all aspects of police work. Taking a global approach, this volume recognizes that policing is prone to the same potential problems of corruption and misconduct everywhere in the world. Highlighting the importance of establishing robust and enduring anti-corruption protocols in new and emerging democracies, the book provides a model comprehensive integrity system, underscoring the need for a sustained commitment to combat corruption.